Bristol, 19th June 08 – Twenty four solo skippers from as young as 21 to veterans in their 60’s are preparing to take part in the bluQube Solo 1000 sailing race that involves 3 legs (the first 185 mile leg is from Mylor to Kinsale, Ireland) covering a total of 1,000 miles. The race begins on Sunday, 29th June at 9.30am from Mylor Sailing Club, near Falmouth. 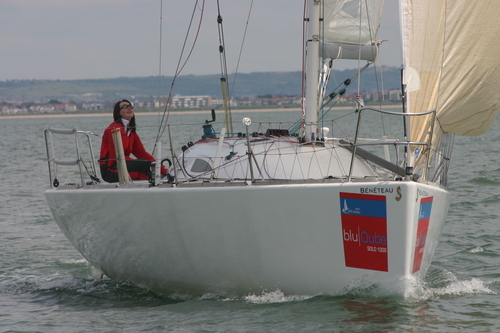 Katie Miller (pictured), aged 21 is the youngest contestant in the field and won the Raymarine YJA Young Sailor of the Year Award in 2006. Katie is studying Yacht Production and Surveying at Southampton Solent University. She explains her decision to enter the bluQube Solo 1000, “The bluQube 1000 Solo will be my first long distance solo race, and will provide a challenging test for me and my boat "Hot Socks". It will be a very steep learning curve and we will be competing against some very talented and very experienced solo racers. Ultimately my aim is to complete the 1000 miles in order to qualify for the OSTAR next year, but it will also be an opportunity to learn from my competitors, and push myself a little bit further than I have before. But right now, I can't wait for it to start." Race Director Paul Peggs from Racing at Petit Bateau, an organisation which has a membership of over 360 solo sailors world wide commented, “Sailors will be travelling from all over the world to take part including Canada, Ireland, Sweden, Norway, Holland and of course the UK. The bluQube Solo 1000 is very appealing because it covers some extremely challenging waters including the Bay of Biscay and is also an official qualifier for the 2009 OSTAR, the famous transatlantic race previously won by Francis Chichester in1960 and Ellen MacArthur in 2000." One of the veteran sailors is Mary Falk aged 62 who lives in Lymington and is also raising money for Cancer Research. Now retired, Mary previously worked as a solicitor in London for over 30 years. Mary describes herself as “Wedded to my boat QII. I didn't start sailing till my late 20s. Then, following a skiing accident was told never to ski again, so took up sailing as the only sport not mentioned to my surgeon and therefore not forbidden.” Since then Mary has continued to both ski and sail and has taken part in many races including two handed Round Britain & Ireland (5 times), Azores and Back (4 times), Singlehanded Transatlantic - OSTAR - (3 times including class record of 19 days 22 hours 57 minutes in 1996) and many of Petit Bateau’s Races. Other contestants are from a variety of professions including lawyers, doctors, surveyors, mariners, IT professionals, financiers and musicians. The other legs in the race include Kinsale to Santander (Spain) and Santander to Camaret (France). Petit Bateau was formed by a group of entrants in the 2000 OSTAR as a means of exchanging information and expertise. Since then it has grown to a membership of over 360 sailors in twelve countries. Joining is free. The only requirement is an enthusiasm for short handed and solo yacht racing. All levels of skill and experience are welcome. The current membership ranges from novices to OSTAR winners, circumnavigators and Olympic medallists. The PB forum allows immediate access to a wealth of expertise and advice, plus an archive of “posts” going back over 7 years. PB members now cooperate in organizing an extensive programme of quality single-handed races. In 2008 they will range from a four race series based in the Solent through to a 1000 mile oceanic challenge sponsored by bluQube which has been designated the official qualifier for OSTAR 2009. This press release was distributed by ResponseSource Press Release Wire on behalf of TTA Communications (Bath) in the following categories: Men's Interest, Entertainment & Arts, Leisure & Hobbies, Women's Interest & Beauty, Sport, Business & Finance, Media & Marketing, Computing & Telecoms, for more information visit https://pressreleasewire.responsesource.com/about.